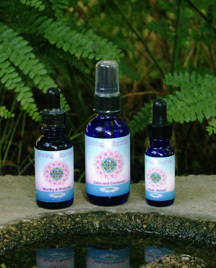 Shining Spirits Formulas are unique blends of flower, tree, crystal, gemstone, sea, environmental, and other vibrational essences. A few of the formulas also contain organic hydrosols, which add aromatherapeutic dimensions to their healing qualities without compromising animal safety. While personalized attention is recommended, especially for anyone with complex concerns, well-rounded premade essence formulas can be highly effective for restoring harmony and inspiring personal growth. They are also helpful in initiating vibrational healing patterns and clearing basic issues prior to completing a healing process through custom therapy. Each Shining Spirits formula revolves around a single core issue and contains a unique group of essences selected to bring its various aspects into greater balance. Individual components include essences that Susan has made along with top quality essences from other respected producers around the world. These formulas are ready-to-use dosage blends. They are always made to order, not mass-produced and sitting in storage. Susan personally prepares each bottle with the same heartfelt attention she gives her personal clients. These combinations are much more affordable than buying comparable individual stock essences and making one's own blends, so they're also an excellent way to begin exploring the benefits of vibrational essences. Essence formulas come standard in 1 ounce dropper bottles, with traditional brandy preservative unless otherwise noted. Aromatherapeutic formulas come standard in 1 ounce spray bottles with food grade alcohol emulsifer/preservative unless otherwise stated in the description. When alcohol preservatives are undesirable, adding the drops to steaming water or tea will evaporate the alcohol more quickly. Essences may also be used topically or specially ordered with nonalcoholic or no preservative. Options include: triple-filtered vodka, organic red shiso vinegar, or sweet vegetable glycerin. Formulas made without preservative are for short-term use only. Please specify any desired alternative preservative when ordering. For additional information regarding these formulas, please see "Formula Concept and Methods" below. Feline Harmony is specifically for creating peace between cats, especially those who prefer solitary or only-cat status. It helps them accept and tolerate the presence of other cats in their energy fields and households, open their hearts to become loving and compassionate for one another, feel protected and safe in their environs, communicate nondefensively, connect with their inner selves and higher guidance, and develop a more lighthearted, joyful approach to life. This is alot to ask of some cats, but patience plus this blend will help create a new, higher vibration, harmonious atmosphere in your home. And if you tend to get caught up in their dramas yourself, then try taking it along with them for best results. Use: Give this formula to all cats in the household; simply stirring a few drops into their communal water bowls is usually sufficient. MultiSpecies Harmony helps animals of different species who are having difficulty living together or in close proximity to one another. It assists them in understanding each other, lessens instinctive fears, promotes clear and nondefensive communication and an awareness of the effect of their own presence on one another, supports a sense of compassion and higher perspective, and aids their evolution. Use: For best results, stir a few drops of this formula into all the animals' water bowls. If you share it yourself, you may find more rapid and harmonious changes occurring, as the animals will sense your support of their efforts through the shifts in your own vibrational field (even if you don't notice it yourself). For human use, simply take 3 drops under the tongue 3-4 times daily, or add them to water or tea. They may also be used topically. Expanded Family formula was originally designed for animal shelters to provide when animals are adopted out. It has proven to be just as beneficial when new members (animals or people) are received into any family. For the newcomer it relieves any sense of unworthiness related to past experience and provides a sense of belonging and optimism about the future. For everyone it relieves jealousy, unkindness, anger, and fears of not having enough love, food or attention to go around. It helps the entire family to adjust to changes within the family dynamic, promoting sociability, lightheartedness and a willingness to play together and improving the tolerance of older animals for younger ones. When used by all family members, this formula creates a harmonious atmosphere in the home for everyone to share. Equally useful for only animals entering a household, multipet families adopting additional animals, assisting older siblings or existing household animals with the arrival of new animals, children or elderly relations, and in the workplace or other groups during additions to staff or membership. Use: best used by all members of the family. Ferals in the Family formula helps feral cats to integrate more easily into domestic households. It addresses self-esteem and their sense of being "different", heals weaning and abandonment isues, alleviates genetic and karmic factors, and assists them in trusting human caretakers and adjusting to human lifestyles. It also helps them and any existing animals in the household to socialize more readily. Feral cats can become the most wonderful domestic companions, especially when taken in early in life and treated with compassion, respect and patience as they adjust to new and loving circumstances. Interspecies Teamwork is a formula for people and animals to take together. It was designed especially for use during behavioral training efforts, and has been found to be equally helpful in teaching therapy animals and service animals. Facilitates learning new behaviors and releasing unwanted ones, enhances clear communication and focus, aids confidence and creativity, and reduces boredom, distractability, and anxiousness. Sharing this blend with your animal will enhance and strengthen the bond between you, in addition to helping you and your animal to function as a team. Available in both dropper and mister bottles. Use: Bottled in a mister for ease of use in any situation. Also available with a dropper top, for adding to water bottles and bowls during outings or events. Heart and Soul enhances the bonds through deepening heart connection and soul attunement. It supports mutual understanding, expands awareness, and spiritualizes relationships. Designed for human-animal bond between people and animals who have a particularly deep relationship or mutual soul purpose, it is especially suited for animals who enjoy joining in meditation practices with their people and those who shared a previous life together. It is equally suitable for pairs of humans, pairs of animals, and deepening relationship with oneself, as well as with entire families who are engaged in soul process together. Use: Please use consciously with heartfelt intention, and only with those to whom you have a lifetime commitment. Visualization and affirmation practices can be absorbed by animals when appropriately directed. One wonderful way to share these essences with your animal is to place several drops in your palm, and then anoint your heart chakras or crown chakras while spending a few minutes lovingly attuning to one another. Calm and Centered formula is for use during and immediately after stressful situations. It acts rapidly to ease extreme anxiety, tension, vulnerability or ungroundedness in response to external events. It quickly calms and stabilizes animals (and people), returning them to their energetic centers and restoring their sense of clear self-awareness and inner peacefulness. Great for use during any acute distress or crisis. Very helpful in medical settings. Similar in application to the irreplaceable Rescue Remedy, with the added energetic benefits of gem elixirs and environmental essences. Use: Use this formula as often as desired. It comes in both mister and spray bottles for ease of application and suitability for everyone. Please see Use & Care flyer for details and instructions. Balanced Activity is for animals who, even when receiving adequate attention and exercise, tend to be overly energetic or hyper-kinetic. Whether due to breed characteristics, early life circumstances, or just individual personal nature, this formula helps those who can’t slow down, don’t know when to stop, or go until they drop to learn moderation and be more aware of their own limits. Useful for over-the-top energy expenditures of any kind, including barking, racing, jumping, over-striving in play or work. May also be helpful with some cases of obsessive/compulsive behavior patterns (depending on underlying issues). Available in dropper and mister bottles. Lick Granuloma addresses healing these lesions as well as resolving the causal imbalances which most frequently underlie them. It eases anxiety, obsessive thought and behavior patterns and compulsive self-stimulation habits, aids skin and tissue healing and supports fur and hair regrowth. Note: Lick granuloma is often a multi-faceted and multi-layered condition involving various symptoms and causes. If your animal's discomfort is not totally resolved by this blend, please consider a personal consultation to complete their healing process. Adapting and Changing supports moving through changes in life with greater ease and grace. It assists acceptance of and adjustment to new circumstances, promotes mental felxibility and emotional calmness, facilitates shifting behaviors, and helps release resistance to change on all levels. Note: for releasing addictive behaviors, see our Liberation formula. Rejuvenation is designed to assist those who feel depleted due to extreme stress levels or extended periods of difficulty in their life. It renews and revitalizes the mind and spirit. It can also aid physiological fatigue related to debilitating tension, although it is not meant for physical recuperative needs. (For that, see Convalescence formula in the Health Support section). Nature Connection formula provides a vibrational link to Nature. While all essences do so, this special blend combines those which most strongly, easily and noticeably forge a connection between those hwo are deprived of spending time in nature and the many energies that exist within it. Refreshing and inspiring for those living in urban environments or confined indoors. Especially wonderful for animals confined to high rises or locations with insufficient light or lacking views and scents of natural surroundings. Brings the vibrations of flowers, trees, crystals, the sea and pure rivers, fresh breezes, and the sun, moon and stars, and the fairies, nature spirits and elemental beings who manifest all of nature into form. Transcending Grief is a bereavement formula. It eases the pain of loss, strengthens faith and trust, and promotes forgiveness and reconnection with loved ones on other levels. Addresses loneliness, calms and comforts, promotes peace and acceptance, and fosters the ability to breathe into the loss rather than resisting it. Aids recovery by assisting movement into, through and beyond it, while allowing the experience of grief to unfold so that it is not blocked or unintegrated. Helps to heal the hearts of animals and people alike, from the loss of beloved animals or people. Use: You may begin use as soon as possible; however, this formula is deeply comforting and healing even for losses which occurred long ago. It is good to continue use of these essences for about 2 weeks longer than cumulative benefits or needs are felt, to anchor in the healing benefits sufficiently. Please share this formula with your family and friends, including animals, who are also experiencing the loss. Many animals grieve very deeply. Pure Space is a space-clearing spray designed for environmental use. It replaces negative and stagnant energies with clear and refreshing vibrations, calms and uplifts moods and instills joy and lightheartedness. It can be incorporated into feng shui practices or used by anyone who simply desires to create feelings of peace, clarity, spaciousness and sanctuary in their home or work place. Note: this product contains 20% hydrosol. Hydrosols are safe for all species in properly diluted form, but are best not taken internally by many animals. This spray is made for broadcasting into the environment, and is not recommended for use directly on anyone's body. Sociability formula is for those who are overly shy. It addresses both social withdrawal and fear aggression resulting from discomfort in groups, eases fears, anxiety, nervousness and past traumas, and strengthens self-esteem, confidence and tolerance for closeness to others, and allows the individual's spirit to shine out joyfully. Helps one to enjoy life more fully and others to enjoy them more often! Use: Daily use for 1-3 months is helpful for most. Animals: 2-4 doses daily. Humans: 4 doses daily. Additional doses before and/or during gatherings with others often expands benefits. Good Boundaries helps those who absorb adverse energies from others or are hypersensitive to their environment due to personal energy fields which are overly porous or expanded, or overly needy emotional states. This blend seals any holes in the aura, aligns and stabilizes the subtle bodies, strengthens the inner energy core and sense of self, and enhances awareness of one’s own inner light and that of the divine protection which is always available to each of us. It alleviates the sense of vulnerability, personal risk and high degree of discomfort which such people and animals feel in crowds, close spaces, unfamiliar territory or environments with heightened emotions. Addresses many issues of co-dependency, and is very helpful for companion animals who absorb or mirror their human family's negative emotions or stresses. It also works to increase awareness of the effects one's own energy system has on others, which is fundamental for insecure animals who strike out at others in heightened defensiveness. Excellent used along with Peaceful Animal formula in cases of fear aggression which are related to weak boundaries. Use: Taking a dose before entering crowded or threatening environments, and repeated frequent use while there, will in time fortify personal boundaries so that such situations no longer induce discomfort. In cases where the underlying imbalances are incarnational in nature, daily use for substantial periods of time (several months rather than several weeks) may be necessary. Separation Comfort addresses separation anxiety. This formula promotes courage, self-esteem, confidence, strong sense of self, stability, and calmness. It helps your animal to stay attuned to you at a distance, especially when taken by both of you. It can also ease the unique and deeply-seated fears of those who have been together and parted in previous lifetimes. Note: Separation anxiety is often a multilevel imbalance with several layers of concerns and patterns. This formula takes into account both various common causes for it, and many of its external signs. If your animal's discomfort is not totally resolved by this formula, please consider a personal consultation to complete their healing process. Use: Daily use in the animal's water bowl for one month, plus additional topical doses prior to your departures (and during your absence if it is for more than one day), until relief is stabilized. Peaceful Animal addresses animal aggression. This formula releases past trauma and the effects of negative training, relieves heightened concerns and outdated beliefs, strengthens inner security and confidence, fosters rational thinking and clarity in assessing others, and facilitates self-control. Always address aggression peacefully and gently. Aggression in animals is a fear-based issue which needs to be regarded with compassion for the animal, as well as with reasonable concern for personal safety and that of others. Aggression is also a complex behavior, often requiring a multifaceted approach for comprehensive resolution. Incorporating bodywork (such as TTouch), Reiki, or Animal Communication services can be very helpful. Custom essence therapy is ideal, but when personalized attention is not possible or practical, especially when matters are unmanageable, this blend is a very good beginning and usually yields significant improvement. Note: In cases of uncontrollable aggression which endangers the animal or others, please seek professional assistance or expert guidance, for the well-being of all concerned. Heartful Hunter is for animals who are natural predators, as well as for their prey and the people who love them and would prefer they didn't stalk and kill other animals. This is a natural behavior in cats, even many who are domesticated and well-fed, as well as some other species. These essences support your animal in attuning to your wishes, changing their habits, exerting greater self-control, and developing openheartedness, compassion for others, evolutionary growth and higher perspective. Use: provide orally or topically, daily for 1-2 months or until behavioral improvements are stabilized. Note: Predation in some species is highly dangerous. If you have an uncontrollable situation or one out of bounds with balanced natural ways, please seek professional assistance or expert guidance, for the well-being of all concerned. Feral Cat Community formula is designed to help groups of feral cats and the wonderful people who help them by practicing trap-neuter-release and feeding station protocols. This essence combination helps the cats to be more accepting of human care, promotes trust, courage and stamina, releases past trauma, addresses negative inherited and karmic influences, and enhances social harmony within the group. Worthy and Welcome formula in our Shelter Formulas section. Expanded Family formula in our Harmony Formulas section. Trauma Recovery releases the effects of trauma and supports recovery on all levels. It clears residue from the experience from the entire energy system including cellular structures, recenters and regrounds, and helps restore balance to the body, mind and spirit. Works on all types of trauma including accidents, abuse, and harsh life circumstances. Effective regardless of how long ago the trauma occurred. Excellent for post-traumatic stress syndrome. A "rescue remedy" for the current age, with plant essences for mental and emotional healing, gemstome/crystal essences for stabilization, and environmental and elemental essences to support transformation and renewed balance. Use: as frequently as needed, for as long as needed. Results are typically noted very rapidly, most often within minutes. For treating significant traumas, continued use for about a month will anchor full benefits into the energy system and support lasting healing. Light and Joy is for animals (and people) who experience depression or low energy due to living with insufficient light in their environment. Useful for SAD (Seasonal Affective Disorder), long winters or rainy seasons, gloomy climates, dark homes or habitats. It improves reception of available light into the energy system, deepens awareness of one's own inner light forces, warms and tonifies the energy system, and uplifts and energizes moods and outlook. When consciously invoked, it can also serve to connect one with beings of light in other realms, such as the Angelic Kingdom, fairies and nature spirits. Home Alone provides comfort to animals who remain at home while their human guardian(s) travel or work extended hours. Especially helpful for single animals who reside without other animals to keep them company, and for those who usually have access to the outdoors but are confined inside while when you're away. This formula relieves anxiety, boredom and loneliness, supports self-sufficiency, self-nurturing and satisfaction with present circumstances, and fosters acceptance of care from others. Use: Mist water bowl daily and stir to disperse. Mist bedding and other favorite rest or play areas for added benefit. Note: Nothing replaces your personal attention and company in your animal's life. Many animals suffer greatly when left alone for long periods. If our lives require frequent or lengthy departures from home, it's often best to arrange for a loving other to stay in our homes, look in or spend time with them each day, or keep them in their home until we return. Calm Traveler formula relieves mental, emotional and physiological discomforts related to traveling. Very helpul for animals uncomfortable in cars, and for plane travel. (Please do not subject your animal to traveling in a baggage compartment.) Addresses anxiety, fear, panic, grounding, nervous stomach distress and motion sickness. Use: comes in a spray for safe use while driving! Start by misting your animal's carrier, or misting your hands and petting them when heading for the car. Then just mist the air or vents in your car as frequently as needed. Contains only essences, water and stabilizer, so cannot be overused. As with all spray products, avoid the eyes. Calm Traveler Mist combines the essences in the formula above and organic hydrosols for added benefit. Hydrosols are an aromatherapeutic product similar to essential oils, but unlike the oils, they are safe in proper dilution for use around cats, birds and other small species. The hydrosols in this blend are Lavender (Lavandula Augustifolia) and Neroli (Citrus Auranum). They help both animals and humans to remain calm and alert, and uplift moods on the road - great for use in heavy traffic or long, stressful travel days on the highway. $20 for 1 oz., $25 for 2 oz. Use: Lightly mist air in car, as needed. Great used in front of air vents to disperse throughout the vehicle. Caution: For environmental use only. Not for internal use. Do not spray animals directly, especially those who self-groom. Calm Boarder aids animals during their stay in boarding facilities. It lessens anxiety, fear, loneliness for you and their home and yard. It also supports them in accepting their current temporary circumstances and caretakers, promotes greater ease in interactions with other animals, and strengthens their trust that you will return and take them home. Calm in Storms clears fears of thunderstorms, a common problem for many animals, as well as young children. It addresses discomfort with barometric shifts and fears of thunder noise. When used as suggested, it often brings the cats and dogs out from under the bed after one storm, and completely relieves their fears after several storms. You can try it for fear of fireworks and other recurrent loud sounds and events in the environment. Use: For situational use, not constitutional/regular use. Administer shortly before and during storms. In most cases you will find that successive storms require fewer applications, and after several, most animals display nonchalance during stormy weather. May require a refresher dose the following year in climates where storms are seasonal. Handled with Care eases difficulties for animals who are nervous or fearful when being groomed. It addresses their underlying fears about being handled physically, discomfort with grooming tools and their noise, relieves anxiety and panic, lessencs defensive behaviors, and improves trust and tolerance for the groomer. Use: may be used orally or topically. For best results, combine daily use for 1-3 months with situational use before and during grooming sessions. Note: Birds need greater dilution. Please request further information, or a special bird formulation. Calm Feet specifically eases distresses related to the handling of paws, claws and hoofs. Helpful whether due to known trauma (recent or past) or unknown reasons. Eases fear, panic, tolerance for foot handling and defensive reactivity. Lick Granuloma: see above, in Balanced Living Formulas section. Separation Comfort: see above, in Good Society Formulas section. Birthing and Bonding is for mothers-to-be, new mothers and newborns. Supports grace during pregancy, ease during the birthing process, balanced maternal instincts and support for the mother, grounding and clarity for the newborn. Deepens and expands the loving bonds between mother and newborn throughout the pre-, per- and post-natal periods. Weaned and Nurtured is for animals who for any reason were not sufficiently weaned or nurtured by their natural mother. It creates a vibrational lifeline to the Divine Mother for nurturing comfort, and to their species oversoul for guidance and wisdom, their soul family for connectedness and support, and their eternal self for individual identity and determination. Facilitates bonding and confidence, restores trust, gives a sense of unconditional love. Relieves over-neediness and eating disorders related to weaning issues. Spay and Neuter - see Health Support Formula section, above. Elder Joy brings renewed interest in life, uplifts and balances moods, enhances flexibility, promotes mental clarity, engenders healthy self-esteem and self-appreciation, aids acceptance of physiological changes, promotes enjoyment of young animals and children, helps connect them with their life purpose and ways to fulfill it, and supports them in knowing and sharing their wisdom with ease and grace. Helpful for elderly humans, too. Note: It's always important to rule out medical causes for emotional, mental and behavioral difficulties. Elder Support strengthens the energy sytem, promotes greater balance within cellular structure, meridians and organs, restores energy reserves, enhances flexibility, promotes mental clarity, and aids acceptance of physiological changes. Great support for elderly animals with health challenges, as well as for maintaaning good health. Note: It's always important to rule out medical causes for emotional, mental and behavioral difficulties. This can be especially true with the elderly, who tend to lack the physiological reserves necessary to overcome stresses to their organs or immune systems. Routine geriatric work-ups can often prevent minor or acute imbalances from developing into serious conditions. This formula is wonderful for supporting animals who are undergoing medical care, but it is not a replacement for apporpriate veterinary or other medical attention. Great Performers is for enhancing performances, especially in public places where distractions are an issue. It is designed especially for animals and humans who are performing together. It fosters focus, concentration, confidence, and interspecies attunement and insight for finding new ways to work together. Eases distractability and vulnerability to external stimuli such as crowd noise and others who are close by. Also aids coordination - great for agility and dressage. Useful for people or animal partners or groups, as well as interspecies work. Use: Share with your partner or performing group for best results in terms of intuitive attunement. See also Learning and Training and Interspecies Teamwork formulas. Service Animals is for animals who work and serve others. Uplifts depression, promotes stamina, fortitude, higher perspective and strong sense of purpose. Very helpful for rescue animals, therapy animals, dogs who accompany human rescue personnel, horses who transport security personnel, carriage horses, and others. Wild and Protected is for wild animals confined to zoos, rescue or rehabilitation situations. It eases their isolation, loneliness and depression and helps to promote a positive outlook and high sense of purpose. Return to the Wild is for use when preparing to release rehabilitated wild animals to natural habitats. It helps to remind them of their natural environs and innate instincts, easing their adjustment back to the wild, and reconnects them to their soul family and species oversoul for guidance. These formulas were developed with great love especially for rabbits, and contain core essences that resonate with the unique energies and soul-level aspirations of their species. To ensure a reasonable shelf life, these formulas are preserved in the traditional manner with food-grade alcohol. Because rabbits are highly sensitive to alcohol, we recommend their essences be further diluted prior to use. Dilution instructions are provided with the blends, and empty dropper and mister bottles suitable for dilution may be ordered from us. Healing Bunny’s Past blend heals effects of past trauma and abuse, releases previous attachments, and aids forgiveness. It restores core integrity, strength, grounding and innocence; nurtures the heart, soothes the mind, and uplifts the emotions. It encourages a positive view of the future by renewing trust, optimism, and self-esteem. Friendly Bunny blend contains heart-opening and nurturing essences to encourage sociability, trust, acceptance, and a calm demeanor. It alleviates excessive shyness and aggression by balancing dominance/submission tendencies, and it promotes group harmony with other rabbits. Note: For harmonizing rabbits with other species, Calm Bunny Instincts blend followed by our MultiSpecies Harmony blend may be a better choice. Calm Bunny Instincts addresses the common underlying needs of many domesticated rabbits. It helps release instinctual fears related to prey species, such as hyper-vigilance, over-sensitivity, anxiety over being physically handled, and bonding difficulties with other animals and humans due to mistrust. Please Note: If your rabbit is frightened of a cat or a dog in the family, firstly be certain that the other animal will not harm the rabbit. If you are sure this is the case, then we suggest giving our MultiSpecies Harmony blend to the whole family after your rabbit has taken calm Bunny Instincts for 2-3 weeks; the combination will help complete the healing process and create a harmonious family constellation. Merry Bunny Massage helps bunny and masseuse alike. It will support bunny’s acceptance of human touch, enhance your sensitivity to their energy needs, promote trust and greater energy flow between you, and release disharmonious energies from the rabbit’s energy field and aura. Note: This blend is to be shared by human masseuse and bunny. Simply mist your hands lightly and massage in to bunny’s fur. Rabbits who are extra nervous by nature may derive added benefit by misting lightly over and around them, their bedding and environs. Worthy and Welcome releases past trauma; restores self-esteem, self-worth, and self-identity; promotes trust, forgiveness, optimism, self-confidence and acceptance of love from others; and aids adjustment to new routines and environments. Designed for animals entering shelter environments, it is equally helpful for any animal or human needing to overcome difficult backgrounds, adjust to new situations, heal brokenheartedness or release attachments to those no longer present, or renew their relationship with self or others. It aids overcoming negativity from the past, embracing the present, and viewing the future with positivity. Very helpful for healing brokenheartedness and attachment to those no longer present, transforming job (or other) loss to new opportunities, starting new ventures after unsuccessful ones, and supporting graceful relocations and transitions of any kind. Use Notes: In shelter and newly adopted/rescued animal situations, rapid responses to this formula are common, with short-term continued use (2-6 weeks) typically yielding extensive benefits. As with all essences, response times vary with the degree, depth and nature of underlying imbalances as well as the readiness of the recipient to release those imbalances. The milder and more recent the trauma, the more rapidly results can be expected. Hope and Courage was originally designed for animals who suffer emotionally when they must endure the effects of longterm shelter placement and fear they may never be released to fulfill their life. It’s also useful for wild animals living in rehabilitation situations, people or animals having difficulty with indoor confinement, urban dwellers with little or no access to nature, and those recovering from trauma or unrelenting, seemingly never-ending sadness or grief. Good for anyone struggling with feelings of discouragement, hopelessness, or despair. It renews fortitude and perseverance in the face of seemingly insurmountable odds; restores connection to the natural world; assists in finding new solutions to old problems and in shifting perspectives, Brings revitalization to the energy system, optimism to the mind, lightness to the heart, and comfort to the spirit. Crate Comfort was designed for animals enduring longterm confinement in shelters, rescue situation, zoos, and other artificial environments. It is immensely helpful as well for any animal who experiences distress in their carrier or when crated. It eases the anxieties, tensions, hysteria, overdefensiveness, depression, fear and loneliness which some animals experience when confined in a cage, crate, or carrier. It addresses boundary, claustrophobia, and isolation issues. It offers strengthening, stabilizing, nurturing and liberating vibrations which promote restoration of inner peace despite adverse external circumstances. Calm and Centered - see Balanced Living Formula section, above. Balanced Compassion was designed for the people who work in animal shelters and rescue sanctuaries. It relieves fatigue, over-sensitivity and over-absorption of pain from others, and it helps to prevent compassion burnout. It uplifts, restores and renews one’s outlook, energy and spirits. It also promotes a higher perspective regarding the suffering one witnesses as a consequence of this type of work, renewing one’s initial inspiration to serve. It’s wonderful for anyone (human or animal) serving as a caregiver for others, especially when feeling drained or overextended. Pure Shelter is an environmental spray made especially for use in animal shelters, where it benefits both the people and the animals. It’s an excellent space-clearing product which replaces negative and stagnant energies with clear and refreshing vibrations. It also serves as mental and emotional balm; it calms and uplifts moods and instills joy and lightheartedness. On a deeper level, it harmonizes the varied species who are living and working together and brings their higher purpose of being together into clearer focus, creating a true feeling of sanctuary for everyone. Also wonderful for veterinary clinics. Caution: this formula contains 10% hydrosol. It is safe for use around animals, but should not be used directly on them. Please see the Use & Care sheet for details and specific instructions on how to use this environmental spray. Shelters and Rescue people: please visit our "Animal Shelters/Rescue" page. Pre-Op Support provides energetic support prior to surgery or other invasive procedures. It enhances inner healing resources, stamina, and faith. Supports moving through physiological, mental and emotional stresses with greater ease and strength. Does not interfere with medical procedures or substances. Use: when possible, begin daily use about 2 weeks prior to procedures. May be taken topically right up until the procedure, if food and water are withheld. Post-Op Support restores grounding, vital life force and conscious awareness after invasive procedures or toxic treatments. Removes traumatic effects, seals breaks in the aura, re-establishes energetic transmissions across areas of wounding and scarring, helps to direct healing forces to areas most in need of them. Does not block, interfere or release any medications such as antibiotics, herbs, etc. Use: as soon as possible after procedure, topically if not yet drinking. Detoxification Support helps release and remove negative substances and foreign matter and their effects, including chemicals, drugs, heavy metals. May also assist with bacteria, viruses, fungus, parasites. Catalyzes cleansing and purification of the aura and entire energy system. Note: not for use during drug protocols. Use: Dose according to health status and severity of toxicity. Standard delivery is 2 daily doses given for 1-6 weeks. With frail or very young individuals, provide a single dose and observe effects for 24 hours; if results are positive, continue single daily doses daily or every other day until treatment is complete. Convalescence Support refreshes, comforts, strengthens and uplifts those who are recuperating from long illness or difficult periods which have left them depleted. Enhances stamina, courage, inner and outer vigor, perseverance, patience and positive outlook. Also assists with cellular hydration, renews appetite, and counteracts fatigue. Use: as desired, for as long as benefits are noted. Therapeutic Support is supportive for all therapy modalities, including traditional and alternative remedies, massage therapy, physical therapy and energy work. It assists the sublte bodies in readily and deeply receiving healing healing energies, and directs healing forces to the areas most in need of them. When used by both therapist anbd client during bodywork it promotes greater energy flow and enhances awareness of client status and needs. Use: Great added to therapeutic carrier oils or creams. For hands-off modalities, apply to hands for receiving and broadcasting benefits. May also be used (cautiously) on and around areas of injury. Spay and Neuter formula addresses the various issues related to these procedures. It facilitates recovery from the surgery, helps the animal to realign their sexual instincts and synchronize their bodily rhythms to earthly rhythms, rebalances male/female energies, aids emotional adjustment and supports self-esteem and forgiveness. Use: Best if given for 1 week before until 3 weeks after the surgery. However, significant benefits will be derived with briefer treatment periods as well. Vet Exam Support addresses the mental, emotional and energetic needs which many animals have when undergoing their medical exams. It also aids those who are working to care for animals, by easing the animal's distress. Assists with their anxieties, fears, and oversensitivities; helps lessen panic reactions and discomfort with being handled, promotes self-control and lessens heightened defensiveness. Use: Mist animal directly, or mist your hand and stroke them. Avoid the eyes. Repeat as needed. Vet Exam Support Mist also contains hydrosols for significant additional calming benefits - highly recommended. Bugs Free provides energetic protection from insects while offering them a higher perspective of their interactions with us. Originally designed as a flea remedy for cats and dogs, it works for animals and humans alike in reducing vulnerability to mosquitos, fleas, flies and ticks. Strengthens the aura to act as a protective etheric shield, nonaggressively repels those we do not wish to interact with, works positively with insects to assist them in seeking other means of survival, and promotes better balance in the host/parasite relationship. When used over time this formula can help to strengthen and stabilize one's natural defenses against invasion from insectary beings in general. Use: May be added to water for oral use or applied topically, as needed. Bugs Free Mist - same as above, with added hydrosol for extra benefit. Combining with oral blend is best for those who are routinely or severely affected. Use: The mister contains 10% hydrosol, and is intended only for topical application. Please apply accordingly to animals who groom themselves. Burns, Bites and Stings is a topical formula which soothes, calms and helps repair tissue damage from minor burns and abrasions and insect bites and stings. Reduces itching and irritation, cools and soothes, and alleviates tension and stress associated with such conditions. Caution: Is supportive of, but not a substitute for, appropriate medical care in cases of serious injury. Contains hydrosols. Use: Intended only for topical use. Use as directed on product label. Heat Relief provides comfort and balance on the physical, mental and emotional levels in conditions of excessive heat. It restores equanimity and groundedness, relieves irritation and irritability, cleanses and soothes the subtle bodies, and allows expansion of the aura to accomodate and accept greater degrees of heat. Originally designed for use in hot climates, it has proven useful for some women experiencing hot flashes, and some cases of fever and skin irritation or rash, as well. Try also in cases of chilling; as several components address temperature modulation, whether too high or too low. Available in either 1 ounce or 1/2 ounce pocket size. Pure Healing Space is an environmental mist especially for use in medical offices and other healing environments. It provides both space-clearing and mental/emotional benefits. Releases negative and stagnant energies from the atmosphere, calms and uplifts moods, aids intuitive interspecies and interpersonal understanding and connection to highest purpose. Helpful for both clients/patients and those working to care for others. Great for refreshing waiting areas and exam rooms between visitors. Use: Mist into the air lightly, as desired. Avoid eyes. Note: Contains organic lavender, neroli and chamomile hydrosols or essential oils (hydrosols only for environments animals frequent). Not for internal use. This blend glows with the celestial brilliance and angelic warmth of heaven. It bridges heaven and earth, connecting us to the light within the Earth that is the planetary embodiment of star power. It provides healing for the aura and the spirit, enhances attunement to ascended beings, and promotes a profound sense of expansion and peace. Contains: full moonlight infusion of Celestite crystal elixir and organic Jasmine Sambac essential oil. Known in India as "Moonlight of the Grove", this night-blooming Jasmine offers a divinely warm and exotic scent born of embracing the mysterious essence of the tropical moon. This blend connects us to our Earth Star, creating a lovely circular flow between our heart, solar and root chakras and revitalizing us with qualities of lightness, warmth, joy and sparkle. It instills qualities of courage, resilience, abundance, strength, rejuvenation, openheartedness, lightheartedness and joy. Contains: Magenta Rock Rose flower essence infused in organic hydrosol of the ancient Apothecary Rose (luscious, heady, fresh scent) and organic Ruby Blood Orange essential oil (intensely aromatic, warming, sparkling scent with antidepressant properties). Creativity blends call in your muses, connect you to your higher guidance and rally your inner active forces to support you in birthing your divine inspiration into form. Suitable for all forms of art and self-expression, including painting, drawing, sculpture, literary, musical, dramatic, dance and other movement.Perfect for creating an inspiring atmosphere in your studio, work area or rehearsal space. These blends were inspired by gifted artist and delightful Earth goddess Lynne Ciccone, who you can meet at www.soulfularts.com. These formulas are available in either 1 ounce or 2 ounce sizes. Creativity: essences only, in a dropper bottle for oral use or a spray for fragrant-sensitive people and places. Or try one of the following aromatherapeutic synergy mists to use on or around yourself or in your environment. Creative Freedom: organic lavender hydrsosol and organic Frankincense essential oil - liberates confidence and releases creative blocks! Creative Heart: organic rose hydrosol and organic Frankincense essential oil - create from your heart, opened by Divine Love! Creative Joy: Ylang Ylang hydrosol and organic Frankincense essential oil - instill the joy of creative fires, within and without! Dreamwork invokes intention and clarity for conscious dreamwork and enhances dream recall. Earth Angel instills the beautiful and profound energies of the Angelic Kingdom into our energy field and awareness. Allows us to feel the angelic aspects of ourselves inherent within us and helps us ground those energies more fully into our energy field. Fairy Spirit helps connect us to the joyful and uplifting energies of the fairy and nature spirit realm. (Not for journeying to the underworld faery realm). Helps us sense the presence of these delightful devic beings and instills within us the enchanting feeling of their light and effervescent nature. Nature Connection provides a vibrational link to Nature. Refreshing and inspiring for those living in urban environments or confined indoors. Instills the energies of flowers, trees, crystals, seas, rivers, breezes, the sun, moon and stars, and fairies and nature spirits into one’s energy field. Animal Communication develops and strengthens telepathic communication skills for conversing with animals of all species. Totem Alliance supports initiating and maintaining contacts with animal totems and other guides. Strengthens our connections and clarifies messages. Provides gentle protection during journeys. Please use only during meditation. Meditation formula supports meditative attunement, quiet centering and inner awareness. Yoga formula supports flexibility, core balance, energy flow especially through the spine, inner focus, and inner attunement. Heart and Soul enhances heart and soul connections. It fosters mutual understanding and awareness, and spiritualizes relationships. Wonderful for soul mates, people and animals who have particularly deep bonds or mutual purpose, bonding with a new baby, even enhancing relationships within families who are engaged in soul process together. Also very helpful for attuning to one's own inner, truest self when seeking to enhance self-awareness and self-knowledge. Use: Please share only with animals to whom you have a lifetime commitment. One perfect way to use this blend is to anoint your heart chakras and/or crown chakras with a drop or two and then lovingly attune to your beloved (or your Self). Forgiveness supports us in moving into a place of forgiveness and compassion for others, starting with ourselves. Deeply restorative for those who have been unable to release old hurts or continue to struggle with current difficulties in relationship. Provides a great service as well when used intentionally for transpersonal forgiveness and for healing racial clefts, community rifts, collective remorse over genocidal and ecological assaults. Peace formula fosters deep peace on the inner, outer and planetary planes. For personal use, sharing in groups, and assisting plants, animals and other aspects of Nature after disturbances and negative impacts. Sacred Space invokes ambient spaces with peace, love, unity and Oneness. Ideal for use after cleaning and space-clearing, and for instilling deep harmony and a sense of the sacred into your meditative environment. May be used to intentionally invoke the presence of Angels or Spirit if desired. Available in dropper form for tabletop fountains or bowls or in a spray form for broadcasting in the air. Sacred Space Mist contains Frankincense, Rose and Galbanum essential oil or hydrosol, depending on species exposure. Clarity and Focus aids concentration by reducing distractibility to internal and external stimuli and enhances information processing and production. Great for accomplishing projects under deadlines, multi-tasking, and absorbing new concepts or many disparate details. Calm and Centered formula is for use during and immediately after stressful situations. It acts rapidly to ease extreme anxiety, tension, vulnerability or ungroundedness in response to external events. It immediately calms and stabilizes, returning people and animals to their energetic centers and restoring their sense of self-awareness and inner peacefulness. Great for use during any acute distress or crisis. Similar in action to the irreplaceable Rescue Remedy, with the added energetic benefits of gem elixirs and environmental essences. Available in both dropper and mister bottles. Calm and Centered Mist is the same as above with added, calming hydrosols. Adapting and Changing supports moving through changes in life with greater ease and grace. It addresses acceptance of and adjustment to new circumstances; mental flexibility and emotional calmness; facilitates new behaviors; helps release resistance to change. Liberation formula supports the release of unwanted chronic behaviors and addictions. It addresses centering, grounding, cravings, inherited patterns, and coping with deep change and significant shifts in lifestyle. Provides a sense of freedom and fresh perspective while working on establishing new patterns. Sweet Sleep is comforting support for releasing the cares of the day and drifting gently off to sleep. It helps those who toss and turn in the middle of the night too, helping us to drop back into our slumbers more readily. Promotes deep restorative sleep so we can awaken rested and refreshed. Trauma Recovery releases the effects of trauma and supports recovery on all levels. Rebalances the entire energy system, cellular structures, re-centers and re-grounds. Restores balance to the body, mind and spirit. Works on all types of trauma including accidents, abuse, and harsh life circumstances, whether the trauma occurred recently or long ago. Excellent for post-traumatic stress syndrome. Light and Joy increases the amount of light our energy bodies can receive and embody. Made for those who experience depression or reduced vitality due to insufficient brightness during long winters, rainy seasons, gloomy climates, dark homes or habitats. Deepens awareness of one's own inner light forces, warms and tonifies the energy system, and uplifts and energizes moods and outlook. Suitable for SAD (Seasonal Affective Disorder). Calm Traveler formula relieves mental, emotional and physiological discomforts related to traveling. Very helpful for those uncomfortable in moving vehicles and airplanes. Addresses anxiety, fear, panic, grounding, nervous stomach distress and motion sickness. Calm Traveler Mist adds organic hydrosols or essential oils to the above formula for added benefits including remaining calm and alert, and uplifting moods on the road. Great for use in heavy traffic, long trips, vulnerability to road rage. Rejuvenation assists those who feel depleted due to extreme stress levels or extended periods of difficulty in their life. It renews and revitalizes the mind and spirit. It can also aid some aspects of physiological fatigue related to debilitating tension, but it is not meant for physical recuperative needs. (See our Convalescence formula in the Health Support section). Hope and Courage is deeply restorative for anyone struggling with feelings of discouragement, hopelessness, or despair. It renews fortitude and perseverance in the face of seemingly insurmountable odds; restores connection to the natural world; assists in finding new solutions to old problems and in shifting perspectives. Brings revitalization to the energy system, optimism to the mind, lightness to the heart, and comfort to the spirit. Balanced Compassion is for caregivers (human and animal) of all kinds, including those caring for ill or disabled family or friends and those engaged in health care and rescue or shelter environments. It relieves feeling drained and over-extended, over-sensitivity and over-absorption of pain from others, fatigue and compassion burnout. It uplifts and restores one’s outlook, energy and spirits. It also promotes a higher perspective regarding the suffering one witnesses as a consequence of this type of work, and helps renew one’s initial inspiration to serve. Also very helpful for all of us who feel overly impacted by worldwide conditions and disasters, helping uplift our perspective and deepen our awareness of the Divine truths behind such situations. Transcending Grief is a bereavement formula. It calms and comforts to ease the pain of loss, strengthens faith and trust, promotes forgiveness, peace and acceptance, and supports connection with loved ones on higher levels. Allows moving into, though and beyond grief, it to unfold and be gently integrated. Useful for losses which occurred long ago as well as impending and recent losses. Also applicable for collective grief absorbed from global situations. Please Note: Susan offers a special blend for children to use when they are grieving the loss of a family member or friend. Please inquire. Pure Space is a space-clearing spray for environmental use. It replaces negative and stagnant energies with clean and refreshing vibrations, calms and uplifts moods and instills sparkling clarity and joy. It can be incorporated into feng shui practices or used whenever feelings of freshness and spaciousness are desired in the home or work place. Pure Space Mist is the same as above, with added aromatherapeutic qualities. Made to order with Lavender and White Sage essential oils or hydrosols, depending on the species using the space. Healer's Shield protects healers by strengthening appropriate boundaries, without lessening their empathic nature. Reduces absorption of the negative energies from others, helps us release any inappropriate energy taken on while working with clients, and grounds and refreshes our energy fields after client sessions. Emotionally uplifting, too. Healer's Insight enhances and supports intuitive awareness, receptivity to higher guidance, diagnostic insight, and creative perspective in seeking solutions for clients’ needs. Healer's Transmission specifically strengthens energy flow to clients and helps direct healing to the areas most in need of it. Warms and energizes healing transmissions. Therapeutic Support is supportive for all therapy modalities, especially bodywork, physical therapy and energy work. It assists the subtle bodies in readily and deeply receiving healing energies, directs healing forces to the areas most in need of them, and strengthens transmission of energy flow from practitioner to client. Aids practitioners in their awareness and communication regarding client status and needs. Use: Great added to carrier oils or creams. Apply to hands for broadcasting with hands-off modalities. Balanced Compassion (please see Balanced Living section for description.) Relieves and helps prevent compassion burnout. Pure Healing Space is an environmental mist especially for use in medical offices and other healing environments. It provides both space-clearing and mental/emotional benefits. Releases stagnant energies and negative emotional vibrations from the atmosphere; calms and uplifts moods; supports connection to highest purpose. Environmental support for clients, patients and healing professionals alike. Great for refreshing waiting areas and examination and treatment rooms. Healing Space Mist is as above, with added essential oil or hydrosol components for additional calming and refreshing benefits. Merry Menopause may sound like an oxymoron, but this new formula is getting rave reviews so far. Helps restore energetic balance and aids moodiness, sleep disturbances, power surges, mental fog and libido issues. Endocrine health is very individual, so I would love to hear feedback on this new blend. It won’t interfere with HRT, herbs and other treatments, though it may lessen or obviate their necessity. Merry Menopause Mist - with luscious Rose, Lavender, Clary Sage and Geranium hydrosols added for extra benefit and pleasure. The scent and energy of pure Rose and others is balm to body, mind and spirit. Immensely restorative for skin! Elder Joy brings renewed interest in life, uplifts and balances moods, enhances flexibility, promotes mental clarity, engenders healthy self-esteem and self-appreciation, aids acceptance of physiological changes, promotes tolerance and enjoyment of young folks, strengthens connection with life purpose, supports knowing and graciously sharing one’s wisdom with others. Elder Support strengthens the energy system, promotes greater balance within cellular structure, meridians and organs, restores energy reserves, enhances flexibility and mental clarity, and aids acceptance of physiological changes. Great support for elderly individuals with health challenges, as well as for maintaining good health as we age. Transition Support is for assistance during the transition process between life and death. Encourages faith, strength, fortitude, courage, positive outlook, and connection with one's eternal self as well as the Angelic realm and loved ones in other realms. Very helpful for those who are assisting in the transition process as well, including grieving family, friends and hospice workers. Moontime Balance helps restore mental, emotional and energetic balance and helps to energetically regulate monthly cycles. Reduces mood swings, negative emotions and thoughts; eases physiological symptoms and tolerance of them. Generally helps women feel more stable on all levels, and less at the mercy of their bodies especially during menstruation. Designed for PMS, but also useful for irregular or difficult periods. May be taken all month long initially, or only symptomatically. Suggested use: begin a week or so before period is expected and continue until completed. For some this combination works best when used initially for an entire cycle or two. Long-term use may not be necessary for when this approach is used. Hot Flash Relief! Okay, I may be the only woman on the planet who has enjoyed her power surges. But they eventually got to be too much for me too. Personally, the Merry Menopause alone made my hot flashes disappear, but for those who need more help, here it is. To be used as needed. Hot Flash Relief Mist - with Lavender, Geranium and Peppermint hydrosols for extra benefit and pleasure. Mist lightly on overheated areas or in aura. Pre-Op Support enhances energetic strength, inner healing resources, stamina, and faith. Supports moving through the physiological, mental and emotional stresses with greater ease and grace. Suitable for any invasive procedures. Does not interfere with medical procedures or substances. Use: Best begun about 2 weeks prior to procedures, but helpful even briefly just beforehand. May be applied topically right up to the time of a procedure when food and water are withheld. Post-Op Support restores groundin and enhances vital life force and conscious awareness after invasive procedures or toxic treatments. Removes traumatic effects, seals breaks in the aura, re-establishes energy flow across wounds, and helps to direct healing forces to the areas most in need of them. Does not block, interfere or release any medications including antibiotics, herbs, etc. Use: begin use as soon as possible after procedure, topically if not taking liquids by mouth. Therapeutic Support is supportive for all therapy modalities, including traditional and alternative remedies, massage therapy, physical therapy and energy work. It assists the subtle bodies in readily and deeply receiving healing energies, and directs healing forces to the areas most in need of them. When used by both therapist and client during bodywork it promotes energy flow and communication regarding client status and needs. Detoxification Support helps release and nullify negative substances and foreign matter and their energetic effects, including chemicals, drugs, heavy metals. May also assist with some bacteria, viruses, fungus, parasites. Catalyzes cleansing and purification of the aura and entire energy system. Important Note: not for use during drug protocols. Use: Dose according to health status and severity of toxicity. Standard delivery is 2 daily doses given for 1-6 weeks. This is a potent formula, so with sensitive, frail or young individuals, provide a single dose and observe effects for 24 hours; if results are positive, continue single daily doses until treatment is complete. If no effects are noted, try the standard 2 doses the second day. Bugs Free provides energetic protection from insects while offering them a higher perspective of their interactions with us. Originally designed as a flea remedy for cats and dogs, it works for animals and humans alike in reducing vulnerability to mosquitoes, fleas, flies, no-see-ums and ticks. Strengthens the aura to act as a protective etheric shield; nonaggressively repels those we do not wish to interact with; works positively with insects to assist them in seeking other means of survival; and promotes better balance in the host/parasite relationship. When used over time this formula can help strengthen and stabilize one's natural defenses against invasion from insectary beings in general. Bugs Free Mist provides the same essences above with added essential oils or hydrosols for topical use. Burns, Bites and Stings is a topical formula that helps repair tissue damage from minor burns and abrasions as well as from insect bites and stings. Reduces itching and irritation, cools and soothes, and alleviates tension and stress associated with such conditions. Note: Is supportive of, but not a substitute for, appropriate medical care in cases of serious injury. Burns, Bites and Stings Mist is as above, with added hydrosols for additional benefit. Heat Relief provides comfort and balance on the physical, mental and emotional levels in conditions of excessive external heat. It restores equanimity and groundedness, relieves irritation and irritability, cleanses and soothes the subtle bodies. Allows expansion of the aura to accommodate and accept greater degrees of heat. Designed for hot climates and weather, this blend is also preventative and ameliorative with heat and other rashes. Available in 1/2 ounce size. Heat Relief Mist - same as above, with Lavender and Geranium hydrosols for additional benefits. Helpful for skin inflammations. Suitable for topical use with all species. 1 ounce size only. Susan is committed to bringing the world of vibrational essences to as many people and animals as possible, and desires to share their astonishing benefits with as many recipients as she can. In today's increasingly complex world, with busy lives and limited expenses, these simple, affordable, readily available solutions to common essence needs are often the perfect solution. Shining Spirits formulas are co-creatively developed by Susan based on her years of experience with clients and seeing what works for them. Deeply acting essences which might predictably catalyze awareness crises are avoided in these formulas. Most of the formulas incorporate gem or mineral elixirs as well as plant essences. Additional components such as elemental, celestial and esoteric essences are included in some formulas to support greater change on various levels, aid transformation and ease the healing process. The number of individual essences in the formulas ranges from 3 to 25, depending on the constellation of imbalances typically associated with the core issue being addressed. Using a large number of essences in combinations allows them to provide a wider range of application and to be effective for a wider group of the imbalances underlying certain core issues than smaller blends may be. As long as resonance and synergy are present, Susan has found that combining more essences than tradition may dictate can be both successful and comfortable, though dosage cycles may be somewhat longer than for custom blends which more accurately target individual needs with fewer components. She considers the ability of people and animals to respond to combinations containing more essences to be it a welcome sign of our evolution and a positive indication that the field of vibrational alchemy is alive and well. Except where noted, the formulas are suitable for both humans and animals. Vibrational essences are completely free of side effects and have no potential for toxicity for any living being. All aromatherapeutic components are therapeutic grade and most are organic. All preservatives are vibrationally cleared through a special process then allowed to rest under a sacred pyramid in the sun and blessed for therapeutic use. Because essential oils are toxic (some even lethal) for some animals (cats and birds in particular), none of the formulas contain them. However, you can request essential oil additions or replacements for the hydrosols when ordering, or simply add your own oils to the bottle when you receive it. (Note: It is important to be aware of our own use of essential oils in our personal self-care and household cleaning routines, so as not to inadvertently create a toxic environment for our animals.) All the formulas are guaranteed to be totally safe to use and free of any side effects when used as directed. Susan prepares each individual dosage bottle when it is ordered, blessing it with personalized healing intention for its recipient. She maintains clear intention and loving attention to the healing qualities being provided, from bottling through labeling and packaging. When appropriate, potency is enhanced by charging the bottles under a sacred pyramid. She packages her formulas with love and gratitude, and sends them out with blessings for the recipient. Using the formulas is very easy, whether orally or topically. Written information is provided with each order. Ordering: Please contact Susan by phone or e-mail to order. Wholesale/Practitioner Rates: If you are interested in retailing these products, or are a healing practitioner interested in using them with your clients, please contact Susan regarding wholesale and pracitioner rates. Animal Welfare Agencies: Susan provides free samples and minimal-cost refills to nonprofit agencies providing care for animals, such as shelters and rescue organizations. Please see our "Animal Shelters/Rescue" page for details. Susan guarantees your satisfaction. If you are not pleased with a product, please feel free to contact her for personal assistance or a refund. Should your product arrive damaged from shipping, please contact Susan for prompt replacement. Due to the nature of vibrational essences, they are not returnable. Susan welcomes feedback of any nature from her clients and customers. If you have interesting experiences, insights or observations to share, or any questions regarding her products or services, she would love to hear from you. Disclaimer: As is the case with all alternative healing modalities, these formulas are not intended to replace appropriate attention from a duly qualified health care professional. Personal responsibility, common sense, and reasonable medical advice should always be sought and heeded. Please consult with your veterinarian if you have concerns about your animal's health and to rule out any physical causes for emotional, mental or behavioral disorders, and be sure to do the same for yourself. Every human and animal being is an individual body and soul. Results obtained with vibrational essences will vary for each of us, but are always positive.